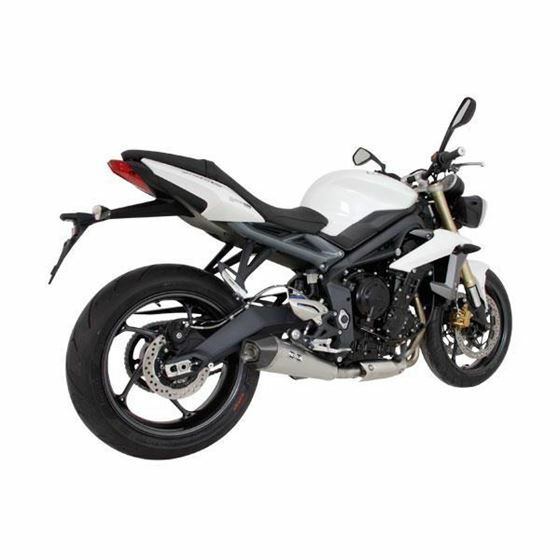 The REMUS HyperCone slip on silencer for the Street Triple 675 R features a conical silencer body with a cf end cap and is the natural development of their market proved REMUS HexaCone exhaust. This HypeCone Exhaust marks the upper end of the REMUS motorcycle high performance silencer line and is sure to please. 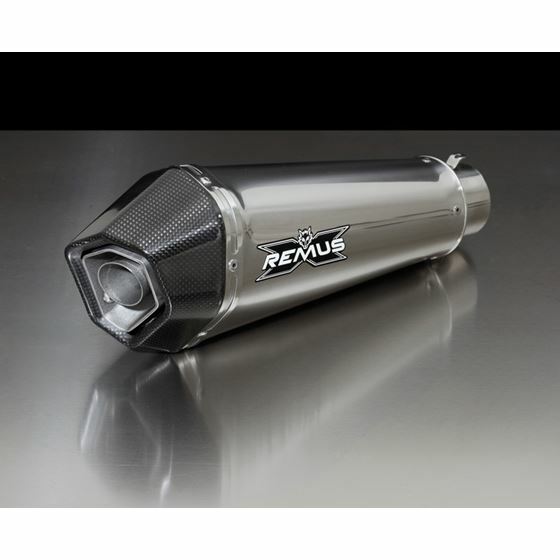 The high points of the REMUS HyperCone exhaust are the carbon outlet cap in combination with a stainless steel or black stainless steel finish, the hexagonal design of the outlet cap and the conical silencer body. This well thought out ingenious combination guarantees maximum ground clearance during cornering. Experience the well known sonorous REMUS sound, a performance and torque increase and a lighter weight. 1-Hypercone Slip-on Muffler Choice of 2 finishes Stainless Steel (6682 914513) or Stainless Steel Black (6782 914513) and connecting pipe. There is no need to remap your system. NOTE: THIS SLIP ON EXHAUST CANNOT BE SHIPPED TO CALIFORNIA ADDRESSES DUE TO CARB RULINGS.